Yes, listeners, some people come out of the closet, but thanks to traffic noise penetrating our 1970s windows, I've been forced into one. As you know from previous posts, we bought a flat and moved in August. I've done some recording since then, but it was marred by the sound of cars from the main road outside. Our windows are single paned aluminium framed horrors from the days when the homes they were attached to had brown wallpaper and portraits of Miss Wong to add a splash of colour. So, I tried recording in the kitchen, but the fridge noise drove me out again. I tried the bedroom; to much echo. I tried the lounge; traffic noise again. I tried the bathroom; echo. I tried the hall; echo! This wasn't good. 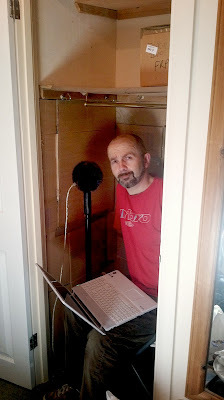 I had to find a recording space to record the new U&F podcast, and I had to find it fast! Then I saw the hall closet. It looked big enough for a medium sized chap like me. So I pulled everything out and tried it out. 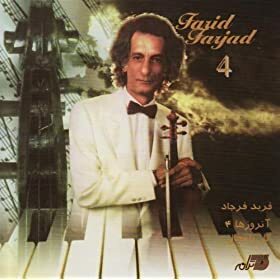 I liked it. 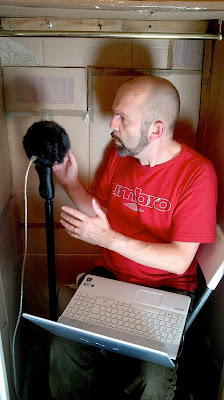 I then lined it with cardboard boxes from the house-move, and lo and behold - a recording suite ... sort of. I tried a number of recording positions, and the one that seems to give the best sound is when I'm sitting in the closet with the microphone positioned just outside facing in. For some reason, the sound with me and the mic inside the closet resulted in too much sibilance. I don't know why. Damn it Jim, I'm a writer not a sound technician. Anyway, the main thing is I have a space to record Blood and Smoke Episode One in. At the end of the month we have some window replacement guys coming to take out the old windows and replace them with a fine set of double glazed beauties that will hopefully block the street noise and permit to come bounding out of the closet in time to record Episode Two. Unless of course, I like it in there. But what are the chances of that happening? 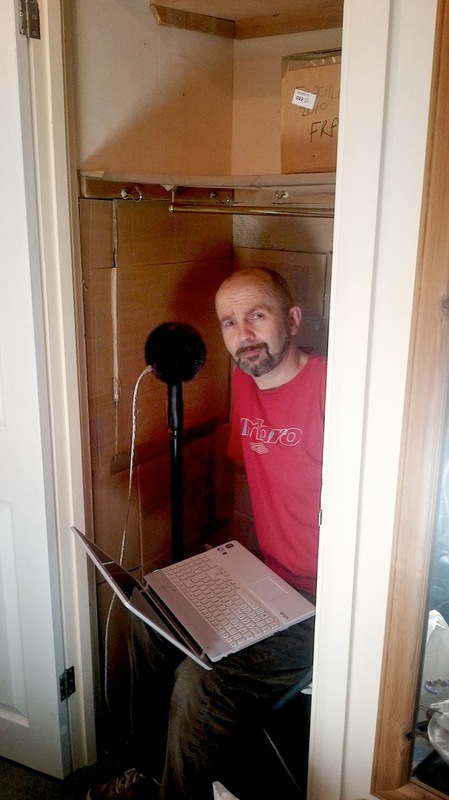 Grown man retreats from normal life into closet ... Hmmmm, is there a story there? By the Sea - A Lexical Chunk Holiday.